Here it comes, from Lely’s North American Headquarters in Pella, Iowa, it’s the Lely Spring Showcase! See our announcement on Facebook here. During the next few months, a number of fabulous prizes could be yours, just by being a fan of Lely. 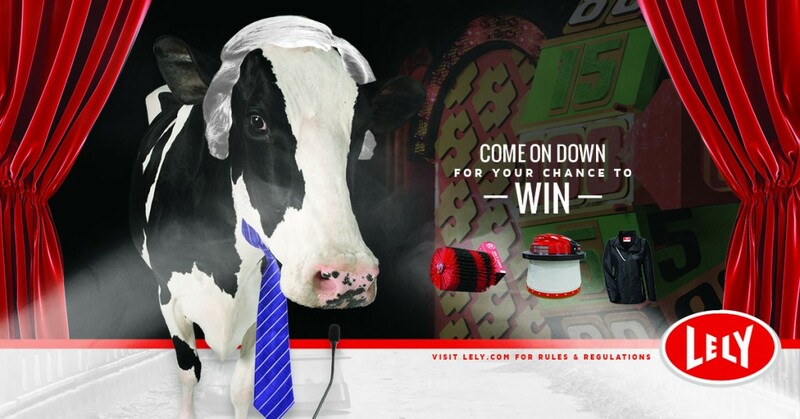 You could win one of six Lely Jackets, one of three Lely Luna Brushes, and one lucky contestant will take home the amazing Lely Juno feed pusher. Pushing feed yourself could be a thing of the past. With the Lely Juno 100 automatic feed pusher, providing fresh feed to cows around the clock has never been easier. The availability of fresh feed results in increased dry matter intake and milk production, which has been found to have a positive impact on the general health of the animal. Pushing feed via tractor or skid loader expended 22.8 times more energy per year than the Juno, which pushed feed three or four times more per day. Payback time averaged one to two years for producers experiencing labor and fuel savings as well as production increases. Needless to say, producers further confirmed through the survey that the Juno feed pusher has become a necessity in their operations. Follow this link to enter to win one of these prizes. From everyone here at Lely North America, Happy New Year and best of luck from Lely in 2017!